How to lose a game which was almost won comfortably…? Pune Warriors may be able to give the best answers. If you have seen the match between Sunrisers and PWI. You would be kicking by seeing SRH batting display and say, one of the worst shot selections i have ever seen. PWI Batsmen said, Boss, We are yet to display our skills of batting for you…That’s the kind of Match it was, Apart from Amit Mishra’s Hattrick which PWI awarded to him, nothing was so bright to talk about this match. Second Match of the day, People expected Mumbai to win it hands down, If not a good fighting game which should provide enough entertainment, But What we got was a absolute shocker, as Mumbai bowled to the worst, Batted like gully cricket, and to sum up all, they were all out with 10 balls to spare. Nothing to leave credit out from Rajasthan, they pouched to the opportunities provided, Dravid’s masterstroke of bring Yagnik in No.3 instead of him, proved very effective, and to his luck, Bowling came damn good on the day it mattered most. It is just another day for Rajasthan, where everything clicked in their Fortress Jaipur. – When Parthiv Patel Scored his first runs for the day, he went past 1000 runs in IPL Career. – This is the first time Sunrisers has been three down before powerplay overs are completed. – 3-18 by Bhuvaneshwar Kumar is his best bowling figures in IPL career. – 25/4 in powerplay overs by SRH is the second lowest for this season, lowest has come from PWI when they scored 24/2 against KXIP. – 119 runs defended by Sunrisers is the lowest ever defended in IPL in India. – Lowest total defended in IPL is 116 runs by CSK in South Africa, In India its 120 runs by Mumbai Indians against Pune Warriors. – This is the first time four wickets have fallen in an over, (19th Over by Amit Mishra). – Amit Mishra picked up the 11th IPL Hat trick, and 3rd of his own bowling in IPL. – This is first time in the season, Mumbai have failed to pick a wicket in between powerplay overs. – 58 runs scored between Watson & Rahane for the opening wicket is the highest ever opening partnership against Mumbai Indians for Rajasthan. – 54 runs scored in powerplay overs by Rajasthan is the highest ever for them in this season. 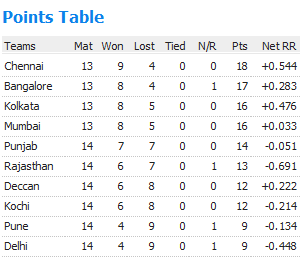 – Rajasthan Royals became the third to go past 50 before Powerplay was over; two other teams are KXIP & Pune Warriors. – Rishi Dhawan became the first bowler of this season to bowl to No balls in a row. – Ajinkya Rahane scored the 7th IPL fifty & first of this season. – Siddarth Trivedi & James Faulkner bowled the 11th & 12th Maiden of this season. – 42 runs scored by Mumbai in first 10 overs is their lowest ever in IPL history. – Rajasthan have never lost a match when they have scored more than 175 runs, now it is 11th time record kept intact. – A defeat for Mumbai with 87 runs is the second heaviest ever for them in IPL History, Heaviest was 105 Vs RR in 2008. – 92 runs scored by Mumbai is also the lowest score for this season by any team, and Mumbai’s second Lowest total ever in IPL. – Mitchell Johnson scored the 600th Boundary for this season. After having last both their previous game, Warne’s men will look to open their account, they got in Damien Martyn(ICL returnee) and Michael Lamb makes their debut today… On the other hand RCB put in the same winning team back on track. RR 92/10 in 19.5 overs. RCB 93/0 in 10.3 overs. RCB WON MATCH BY 10 WICKETS. 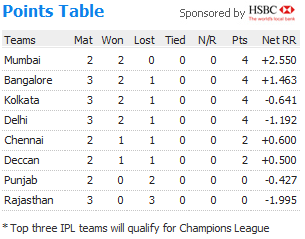 – 44/2 is the lowest scored by any team in first 10 overs in IPL so far. – Rajasthan Royals innings had 67 dot balls, which is also a unique record for being high numbers. – Yusuf Pathan hit the 100th six of IPL season 3. – Yusuf Pathan’s second six was the longest as it lengthed 102 meters, bettering 98 meters previous best by Robin uthappa. – RCB became the third team to chase the target without losing any wicket. Deccan Chargers(2008) and Delhi Daredevils(2009) are the two teams previously two win the match by 10 wickets. – Praveen Kumar becomes the first one to pick Hattrick for season 3 and seventh to secure this feat. – Previous one’s to have taken Hattrick’s are as follows in their order to secure the feat. – 57 balls victory is the Second biggest win by balls, previous was 87 balls by Mumbai Indians over Kolkata. – Jacques Kallis secured his third continous Man of the Match award and another point to note is he is yet to be dismissed in this season. Still reamins not out after 3 fabulous innings. Orange Cap – J.Kallis (198) followed by Ravi Bopara (133). Purple Cap – Chaminda Vaas (5) followed by Angelo Matthews, Praveen Kumar And Maharoof with same 5 wickets to their name.